A rich and creamy homemade soup recipe that only takes 30 minutes to make but will make you feel warm and cozy all day long! When I was growing up, if someone got sick at our house, Mama or Daddy made chicken soup. I can still see the pot on the stove with the whole chicken in it with celery stalks and bay leaves bobbing around. I always thought it was just an old wives’ tale that chicken soup helped you get over a cold or flu but there really are medicinal elements to the soup! 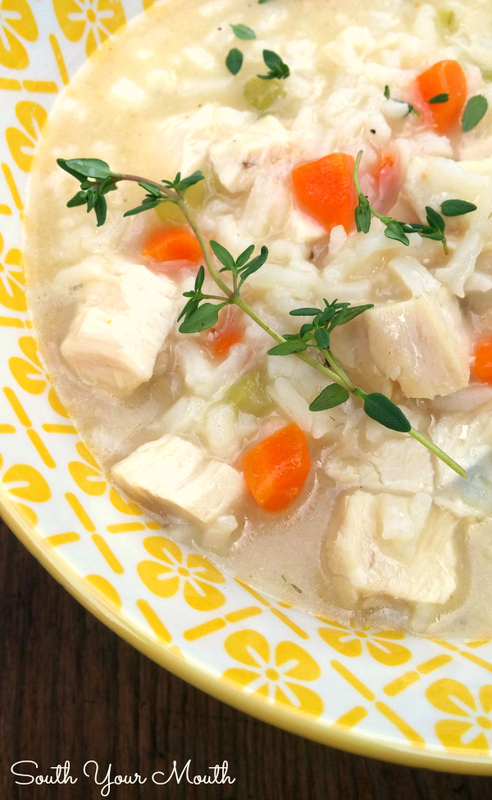 Studies have found that chicken soup helps ALL SORTS of ways to ease your symptoms (see details at the very bottom of the post and also check out this recipe for Chicken Detox Soup!). While nothing will cure a viral cold or flu, getting some relief from the symptoms while you’re letting it run its course is what we need the most, right? Even if it didn’t actually do anything to help (which how cool is it that it does??!) just knowing that someone took the time to make something just to comfort you does wonders for the soul. That rich, hot broth soothes and coats a sore throat better than anything in my book! Now, the way I grew up, we always used whole chickens for everything. We made our own stock, low and slow, getting all the flavor and richness from the skin and bones but, if you’re like me, you don’t always have time for that so THANK GOODNESS there are a few really good ready-made broths out there that have all that homemade taste – and y’all know College Inn is my go-to brand. Because I’m a working mom who doesn’t often have the time to love on a pot of soup all day – and if someone’s sick, I need to act quick! 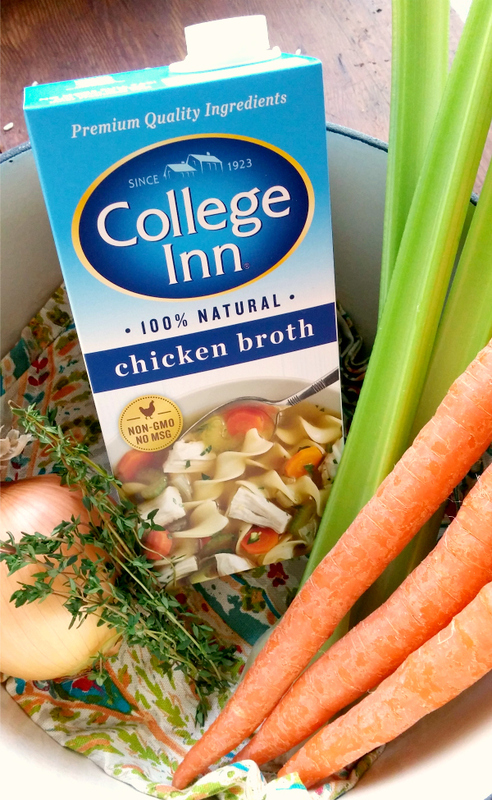 – I came up with this quick and easy recipe using College Inn broth that has all the same layers of flavor as the all-day soup but cooks up in a fraction of the time! 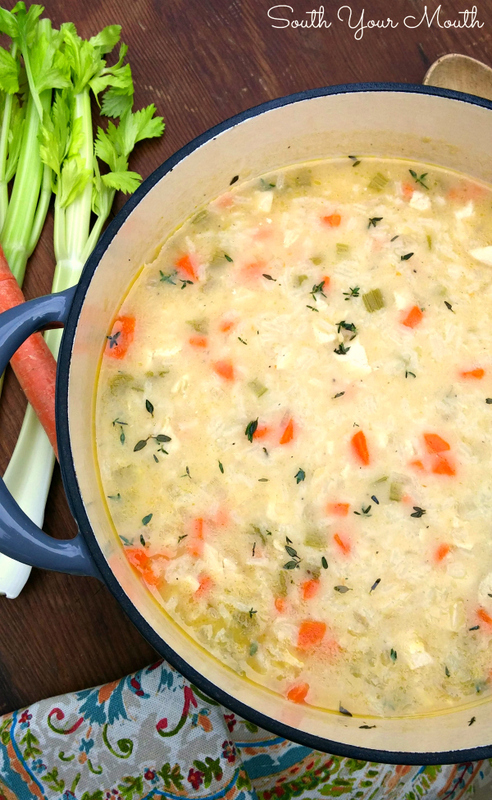 This recipe makes a BIG BATCH so it’s perfect to stock the freezer with. I’m all about not wasting food, time or money so recipes like this are perfect for my family. And it’s always nice to have a little extra in the freezer to get through the fall and winter seasons. You might be the one who gets sick so you better stock up! 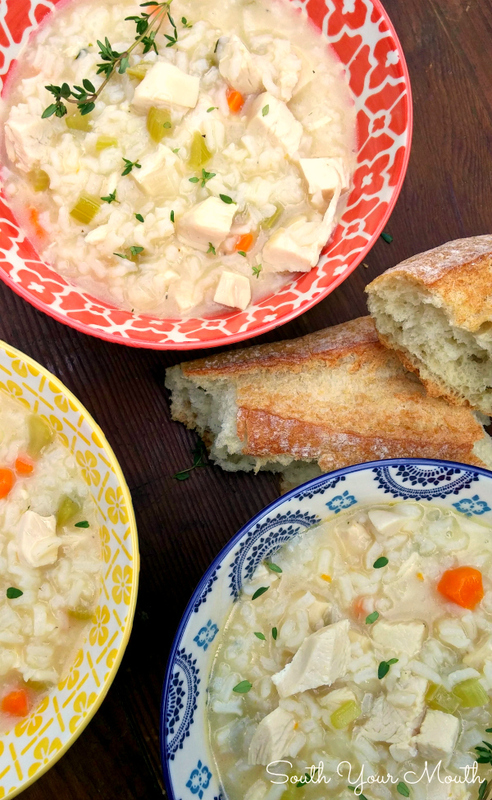 I know for sure my husband wouldn’t make me soup from scratch – even if it is this quick and easy. Sauté butter, onions, celery and carrots in a large pot or dutch oven over medium-high heat until veggies are tender (about 5 minutes). Reduce heat to medium then add garlic powder, thyme, bay leaves and flour then continue cooking 2-3 minutes. Add chicken broth to the pot then bring to a boil. Add rice, reduce heat to medium, cover and continue cooking 20 minutes or until rice is tender. Season soup to taste with salt and pepper, stir in chicken then serve. A rotisserie chicken works perfect with this recipe! You can also toss a few chicken breasts in the pot when you add the rice then remove them after 5-7 minutes or when they’re cooked through. The flour just makes the soup extra thick and creamy. Feel free to leave it our if you prefer. Add water or more broth if desired after adding the chicken to reach the consistency you like best. According to the sources below (and several others I read), Chicken Soup actually reduces respiratory tract inflammation, inhibits the migration of mucus-inducing cells, increases antibody production, stimulates production of immune cells, thins nasal mucus, aids in hydration and improves airflow. WHO KNEW? !